Knee pads are essential safety gear for basketball players. They protect knees from injury as well as hasten the healing of existing injuries by protecting them. 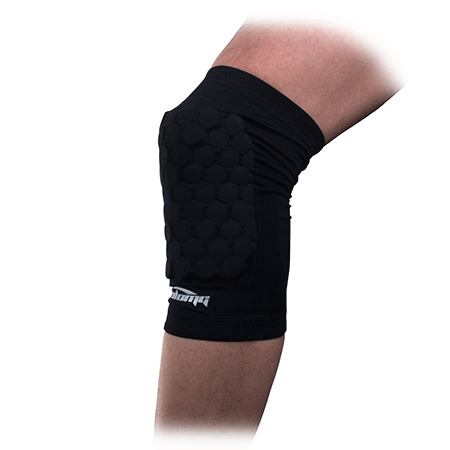 Put simply, a knee pad consists of a foam-based cushioning and an elastic sleeve that holds onto the player’s knee. A good knee pad absorbs shock when a player falls; and there are many falls during a basketball game. This article outlines the top knee pads for basketball players to choose from. 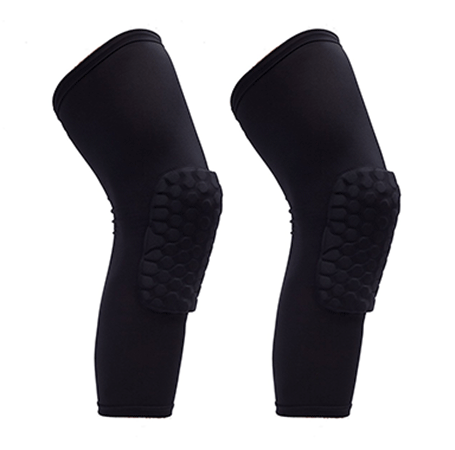 Designed for all outdoor sports, including basketball, football, and volleyball among others, these knee pads are offered either as short or long size with three different sizes in each of the two categories. To this end, they can accommodate a wide range of players. Created with honeycomb technology, the pads prevent impact while their shape disperses impact effectively. The winking fabric that makes the pads gives it a premium feel and enhances its durability. 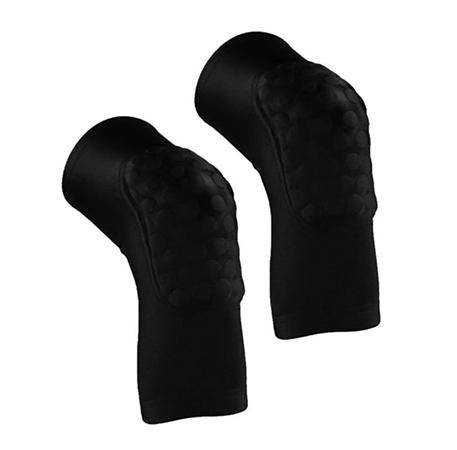 Better yet, it maintains surface temperature to protect the player from muscle strain. The addition of silicone in the fabric prevents slips during play. Morris was created specifically for basketball making it a perfect choice for basketball players. It is created to offer protection and comfort. The COOLOMG was designed for children and adults. They come in five sizes and seven colors. Seeing that they are created with soft elastic polyester material, the pads are able to comfortably accommodate many players. These pads are short sleeved for comfort while wearing and comes with an anti-slip band to ensure they do not fall while playing. McDavid 6446 was created for basketball players but can also be used for other outdoor sports such as volleyball. This kneepad comes in 5 sizes and an elastic material to fit in different leg sizes. The pad has grown in popularity among professional basketball players thanks to its great quality and comfortable design. It is comprised of 80 percent nylon and 20 percent spandex; these are coupled with Hydrvent hDc fabric which easily wicks away moisture, mostly sweat, from the skin. The hexpad protection is a whopping 9mm. Its long sleeve ensures the pad does not slip. The AceList Kneepad was created to offer protection for basketball players’ knees; they, however, can be used for other sports. These pads offer sturdiness and comfort while reducing knee pain and swelling. Its material maintains surface temperature thus protecting the muscles from strain. It comes with an easy to wash material that does not expand after washing or produce odors. The pad was created to offer patella support and allow great flexibility and motion without chafing or irritating the skin. Ant-itch material is breathable and comfortable. 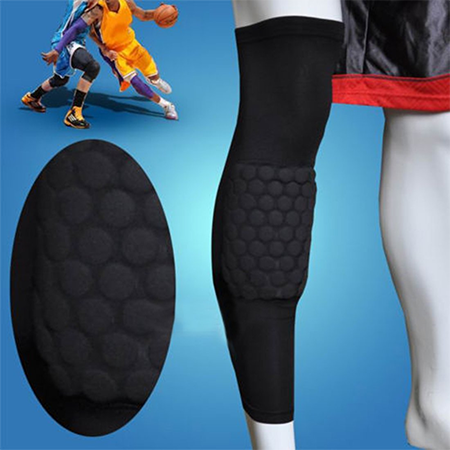 The Reaches Knee Pad, designed for basketball players, comes in 4 sizes with the S size only for teenagers and XL is the largest and suitable for adults with big thigh sizes. This pad provides muscle support, reduces muscle and knee pains, reduce swelling and reduce injuries by reducing impact after a fall. 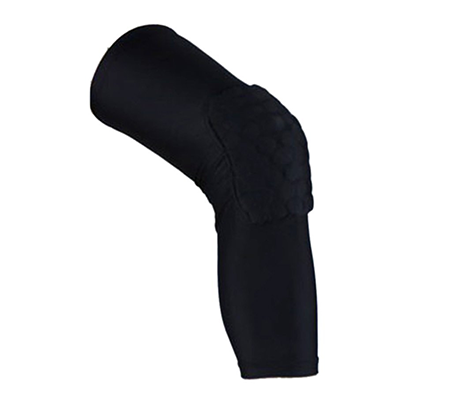 This sleeve is meant to protect the knee, shin or elbow. It is offered with hexpad technology that makes it fit for all forms of impact absorption and makes it fit perfectly into the player’s knee or elbow. It is popular thanks to its hex-shaped pads that conform to the player’s body making them comfortable to use. 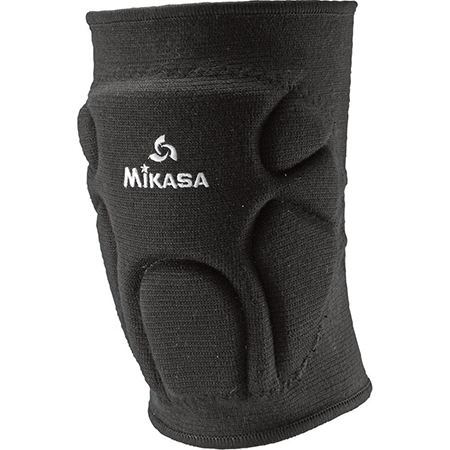 Mikasa kneepads are designed for young players and are popular for their thick and tough padding. The pads sport elastic knit material which not only stretches to accommodate different leg sizes but also allows leg movement. The material is light enough, breathable and anti-microbial thereby preventing bad odors. The Meidus kneecap is offered with premium quality soft and elastic polyester material. It was created with the object of relieving players of joint and muscle pains, stiffness and soreness. 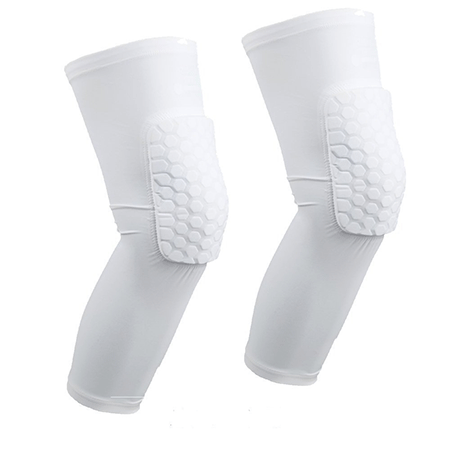 This kneecap is available in four sizes and 6 colors making it fit for a wide range of player leg sizes. 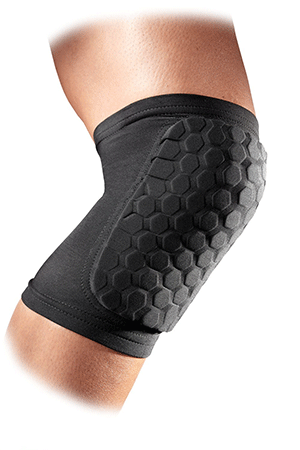 Hexagonal honeycomb ensures stability of knee and leg muscles. It features an anti-slip band to prevent it from falling off and with its breathable material; the kneepad prevents the leg or arm from pulling during a basketball game. The AGPtek is a simple basketball kneepad with standard but enhanced features for protection and comfort when playing outdoor activities. This pad was created with honeycomb pad design for maximum protection and comes with an anti-slip band that prevents it from falling off. The kneepad is available in four colors (white, black, blue and red) and in three sizes to accommodate a high number of players. Its fabric is breathable and elastic and expels sweat easily. There are kneepads for every sport. 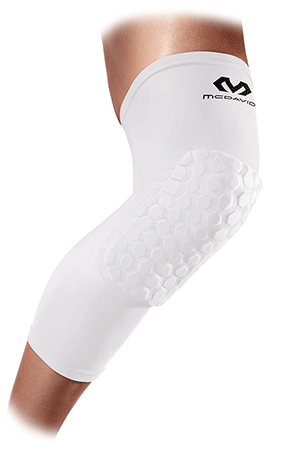 These knee pads are being adjusted to perform specific functions as well as meet diverse needs of players. 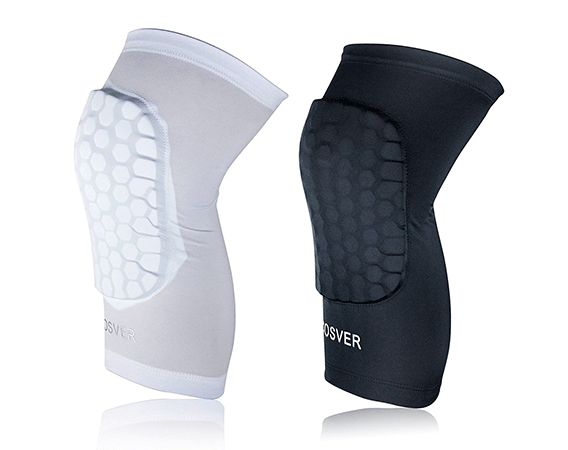 Though the primary function of a knee pad is to protect the knee, players are nowadays shopping for pads that are lightweight, comfortable, flexible, breathable, sleek, easy to put on and easy to clean, stylish, qualitative and affordable. To this end, the main factors to consider when choosing a knee pad include material, size, style and price quality ratio. There are hard and soft pads; players will choose either based on the intensity and number of expected falls. The kneepad you choose should be comfortable on your knee and shin and should fall within your budget. Be sure to follow measurement instructions provided by the manufacturer to get a good fit kneepad.